I’m a year delayed in writing but my memory of our 2-week New Zealand Cruise is as fresh as yesterday. We were braving the Tasman Sea for 2 days straight from Sydney so this was the first site of dry land we had in 48 hours. The ship was already docked at Port Chalmers when we woke up in the morning. It was a very nice welcome for our first official stop in New Zealand. We didn’t get the excursion from the boat since we wanted to explore the city by ourselves. 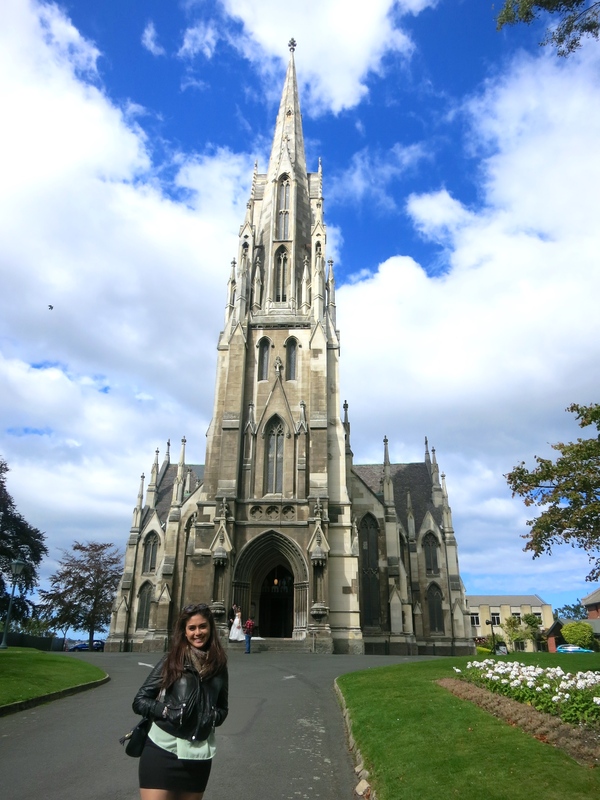 Dunedin was about 11 miles from Port Chalmers so we took a bus that dropped us in the middle of the city. We didn’t have that much time to sightsee as we had to be back in the ship by 4:30pm so here’s how we spent our short stay in this Scottish-inspired city. We were dropped off at the famous eight-sided plaza called the Octagon. This is the main district of Dunedin with its many bars, cafes and shops in the area. Here you can easily spot St. Paul’s Cathedral and the Municipal Chambers. It is dissected by George Street and Princes Street, which are the two major streets in the city – also where all the shopping is found! Just a stone throw away from the Octagon is the famous Cadbury World.We walked down the Lower Stuart St., made a left to Cumberland St. and found ourselves at the front of the doorsteps of chocolate wonderland. We shopped like crazy in their chocolate store. If you want to see how they make our favorite chocolate bar, they offer a tour inside their factory. They also have a cute little Cadbury Café right beside. 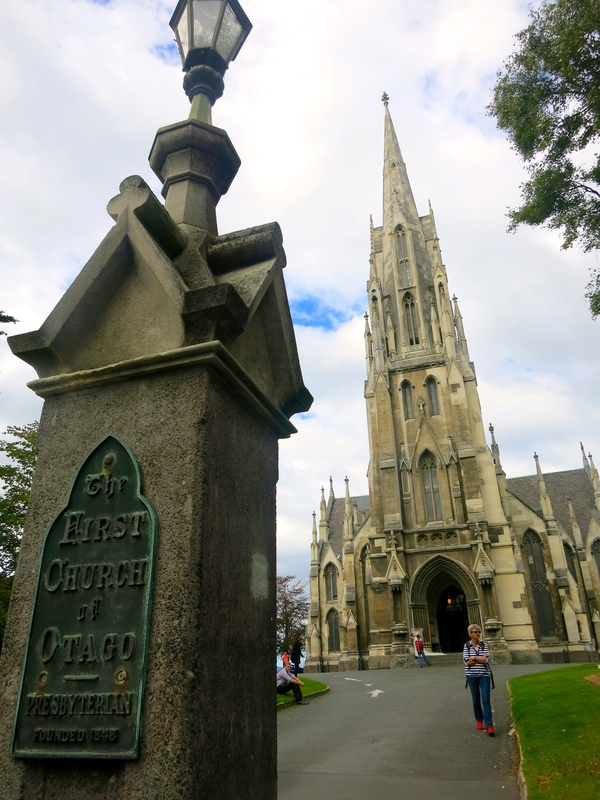 Dunedin is said to be New Zealand’s architectural heritage capital. You can still see Victorian buildings around the corners of the city like the Railway Station. This is probably one of the most famous architectural structures in Dunedin. It is definitely the most photographed structure in the entire city – it is beautiful undeniably! After walking around the small city, we wanted to just relax. We were so happy when we saw the Speights Brewery just around the corner of Rattray Street. There was a tour available but we just wanted to drink so we went straight to the bar to order their draft beer. We were sampling different types of beer. I really liked how they decorated the place and we really enjoyed our beer! Definitely a must go to when you’re in this place. Walking around this seemingly tiny place is fun because you get to bump into structures like this one. We sprung into this church not knowing it was the first church ever built in Otago. It was simply beautiful and impressive seeing this right in the heart of the city. Unfortunately, it was closed and we didn’t get to see the inside. There are more things to see in Dunedin than what I just mentioned but since we were only there for practically 5 hours, these were all we could possibly do. But other things you can do are seeing the Botanical Gardens, take a tour in the Otago Settler’s Museum to learn more about the history, you can go shopping in Princess Street, even check out the Larnach Castle and so much more! That was quite another impressive write-up! I cannot believe you were able to squeeze all those things in just a matter of 5 hours. Sounds hectic but Im sure it was fun! Especially seeing you with your family and loved ones. Hope to read more about your adventures! Good job! You really are a character! Stay beautiful.